RAISE UR PAW FOR SHELTERED ANIMALS!!! There are so many sheltered animals out there needing loving homes and families - but one birthday dream may help change that. 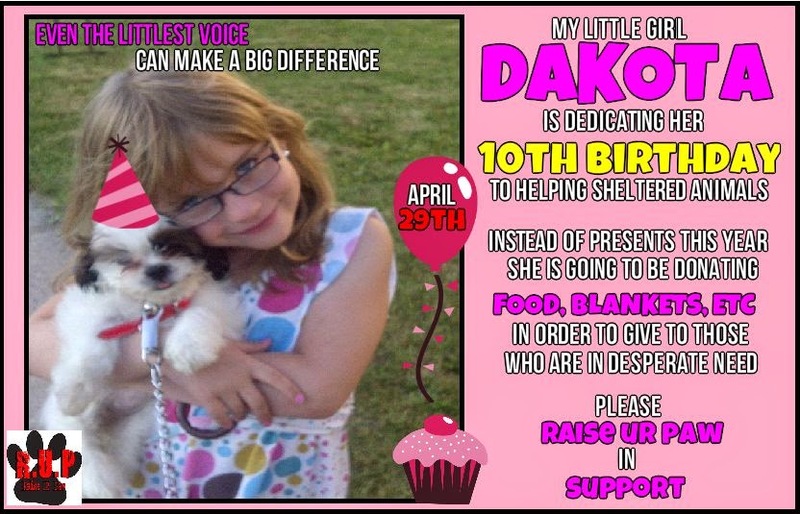 9 year old, DAKOTA ATHERTON, who turns 10 on April 29th - wants to have a special "RAISE UR PAW Birthday" dedicated to helping sheltered animals. Instead of presents this year - she is requesting her family and friends and even animal angels around the world to either donate pet food, blankets, or anything that they can to help these innocent babies in need - even adopt, foster, rescue if possible. Dakota's love for animals and her bond with her "fur baby" Tiny, has inspired her to reach out her little paw and use her special day to dedicate to those in need. But another reason for such an inspiring dedication, is in honor of a very dear and important family member "PJ" - who crossed the rainbow bridge 7 months ago. This loss truly hit the family hard and Dakota wanted to give the same love and compassion to other animals as she did for PJ - and thus came up with the idea for her birthday, so that sheltered animals can receive the same love and companionship from very special people - the way that we felt about PJ. She hopes that this first mission to helping animals will not only help these babies get adopted by loving and caring families, but also that more children will become involved and inspired to raise their little paws for animals as well. PLEASE HELP DAKOTA'S BIRTHDAY DREAM COME TRUE - it only takes a moment to show your support and donate to your local shelters - these innocent babies are needing us desperately - Adopt/Foster/Rescue Today!